From 2006: Billy and Barbie wonder: why the lies? Seriously: why do leaders pretend they aren't in it for themselves? They could stop lying and life would be simple for all of us. Barbie Ballpoint Vs. Protester of Protesting! Seriously, kids--remove a person's ability to be heard and there are only two directions for them to go in: submit or get violent. From 2006: Barbie's expectations are much too high. Barbie gets sick of all these men telling her what to do with her body! Getting back to the more violent roots of Ballpoint Adventures with this one! Why? Because the shoe fits! Go after the rights of ALL WOMEN when pretty much anyone can buy a gun and kill someone suggests that you believe there is something inherently violent about a woman. Statistically, it's much safer to assume that about us men. I mean, how many wars have been fought by women? Pretty sure it's none. Weird how men are the ones trying to limit women's right to "kill" but think war is just fine and dandy. From 2006: George W. was "funny". Yeah, this is 4 of MANY of my comic strips on George W. Bush's 2006 State of the Union address. They do get more "funny" so please stay tuned. 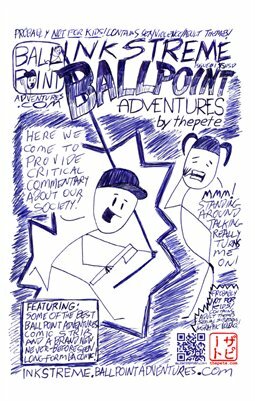 Have you bought Inkstreme Ballpoint Adventures yet? Go order yourself a copy! Honestly, I drew this back in February but left the number blank until this week. Let's hope I don't have to reset the number for a long while. The good new is that in 2008 Billy and Barbie would have much less to complain about (but not nothing). This is the 3rd of MANY strips I wrote for George W. Bush's 2006 State of the Union address. PLENTY more to come. This is based on an actual conversation I over heard in midtown Manhattan, just a few days ago.